You've found the “U.S. 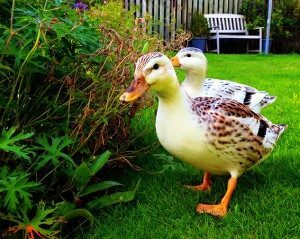 Silver Appleyard Bantam Duck Breeders” page here at Hobby Farm Wisdom! If this is the first time you have visited our site: Welcome! Also referred to as the Miniature Silver Appleyard, and its one third the size of a large Silver Appleyard bird. Their colors are similar to the Abacot Ranger and the Silver Appleyard. They are primarily used for exhibition or as ornamental pets and are capable of laying 60 to 160 eggs per year. They are determined sitters so eggs must be collected daily. The weight of a drake is usually around 3 lbs and the duck will weigh around 2-2.5 lbs. They are visually attractive birds and they are also very hardy. Despite their small size, they are very meaty and they’re useful to keep in a backyard as a garden bird since they enjoy preying on slugs and snails.